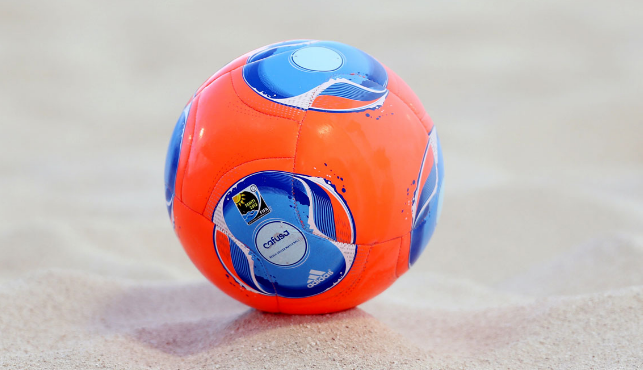 We will talk about the best beach soccer balls today! Beach soccer is a popular game & played all over the world. Summer is the most suitable time to play beach soccer! If you want to play beach soccer, you only need a beach soccer ball and a pair of beach socks for foot protection. You can't use a regular soccer ball to play beach soccer. 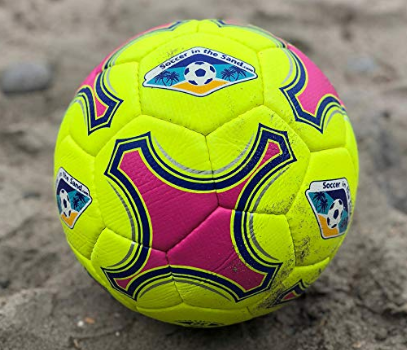 Below, I will look at three popular sand soccer balls from Senda, Select, Goliath and Soccer-in-the-Sand let you decide which one is perfect for you. The Senda Playa Soccer ball is constructed with 6 water-resistant panels with foam cushioning to provide a soft, scratch resistant & highly durable ball. 6 big panels provide a larger space for your foot to kick. Every single panel is machine stitched to ensure a strong & tight joint. They use a 5mm foam under the ball cover to provide a soft and comfortable touch. They minimize the number of panels so that you can play the game without wearing any protective gear (beach socks/beach shoes) on your foot. Its latex bladder offers excellent air retention which helps to retain its shape. 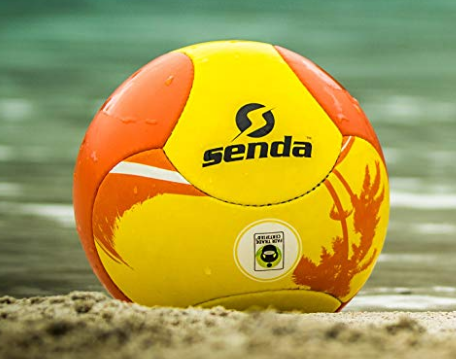 Senda beach soccer ball is water resistant but I recommend to use it only for playing in sand not sea. This traditional beach soccer ball is bright and easily identified. You need a standard ball pump to inflate the ball. All Senda's balls are Fair Trade Certified which ensures safety and standard wage of all its workers worldwide. They also offer a 1-year manufacturer warranty. Best beach soccer ball on the market. Size 4 ball is recommended for children who are between 8 to 12 & Size 5 ball is recommended for people who are above 13. 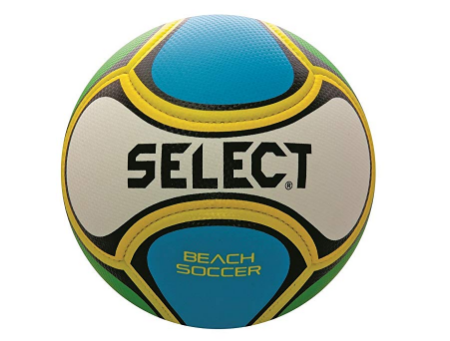 Select is another big brand in beach soccer. This top rated beach soccer ball is made of newly developed rubber material. Its cover is waterproof and soundproof and padded with TPE foam for extra comfort. This is a 6-panel ball and machine stitched. It will last longer than other same priced beach soccer ball. They use bright yellow color for better visibility. Its butyl bladder ensures best air retention & good bounce. This ball comes deflated & no pump with it. So, you need a pump to inflate it. It has a 1-year stitching warranty. This ball is ideal for beach soccer or regular soccer training on a beach. It also suitable for kids because it has a lot of cushions and doesn't heart feet. This 6-panel select sand soccer ball is soft and water-resistant. The outside of the ball is made from premium PU materials and padded with TPE foam for extra softness and highest durability. Its butyl bladder ensures maximum air retention. This machine sewn ball is very bright and comes with a 1-year warranty. 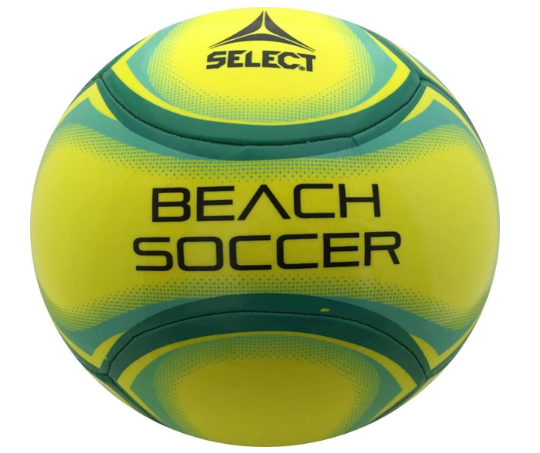 The Select Sport America Beach Soccer Ball is ideal for training and playing on a sandy beach and safe for kids. It doesn't hurt your feet but I recommend to wear some sand socks. This sand soccer ball is very good quality and well-priced. It's not a big brand but they produce cheap soccer balls without sacrificing quality. This sand soccer ball is also made with high-quality rubber materials. Its upper part is foam padded. So the ball is soft, light, durable and sand & water resistant. It never hearts your feet. So, you can play without foot protection (sand soccer socks). But if sand is hot or cold or sharp, you must wear beach socks. Its butyl bladder is strong enough and can hold air for a long time. Nice color, You will love it. If you have a very little budget for your beach soccer ball, I highly recommend it. If you want to buy a cheap beach soccer ball to play a fun match with friends and family then Goliath beach soccer ball is perfect for you. 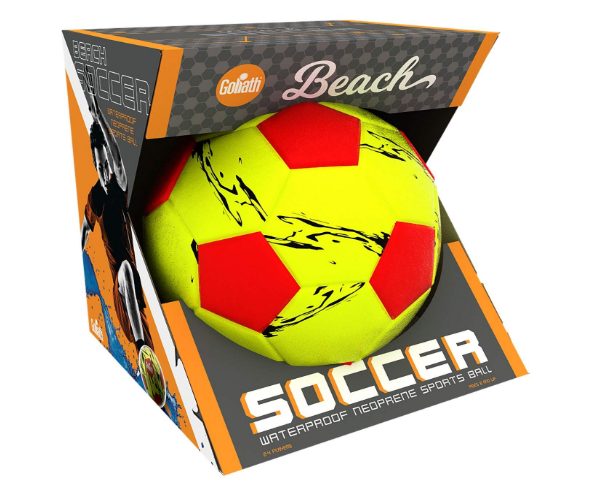 This sand soccer ball is machine stitched, long-lasting and soft enough to play on bare feet. Its cover is made of high-quality neoprene & bladder is made of butyl for excellent air retention. This size 3 ball is specially designed only for youngest soccer players. You will love its bright color and price! After reading this review, I think buying a beach soccer ball is no more a difficult task for you. The beach soccer balls reviewed above are best on the market. They are soft, comfortable, durable, long-lasting and safe for kids. They will make you enjoy the game. For best protection of your feet, you need to buy a pair of sand socks. Hope you will love our sand socks reviews too.